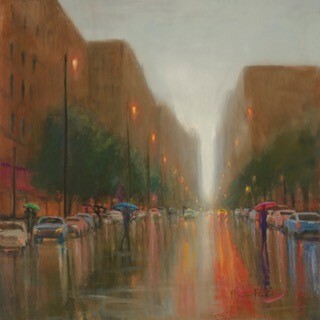 Asheville Gallery of Art’s July show features the work of Cheryl Keefer whose signature impressionist style interprets moody landscapes as well as urban scenes. The show runs July 1-31 during gallery hours, 11 a.m.-6 p.m. Monday through Saturday and 1-4 p.m. Sunday. The gallery, located at 82 Patton Avenue in Asheville, across from Pritchard Park, will host a reception for the artist on Friday, July 7, from 5-8 p.m. Everyone is cordially invited to stop by. The artist enjoys oil painting en plein air, whether on a mountainside or along a marsh. She is often inspired to listen to that still small voice that speaks to her, sometimes quietly, filling her with awe and gratitude, and moving her to create. Simple ideas become visual expressions of her personal epiphanies: morning light glistening on a wooded stream, a sunset punctuating a cloudy sky, fresh spring blossoms highlighting an otherwise gray day, a red umbrella piercing through the rain. In a loud world full of so many inconsistencies, Keefer says she finds wonder and joy in the rhythmic cycles of life on earth, celebrating all seasons in all kinds of weather and times of day. Each composition reflects her endeavor to rejoice everyday, and her hope in the wondrousness of creation. "Momentous occasions of life are few and far between so I want the viewer to see cause for celebration, even in the rain." The artist holds degrees in art history and art education from The University of Alabama, Birmingham, and graduate painting from Virginia Commonwealth University. 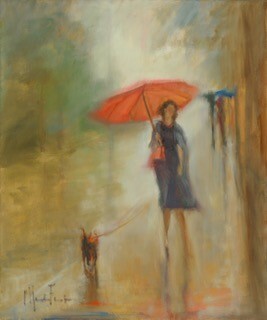 She enjoys working and visiting with clients and friends in her studio, NorthLight, in Asheville’s River Arts District. Keefer’s work, as well as the paintings of the other 30 gallery members will be on display and for sale through the month of July. For further information about this show, you can contact Asheville Gallery of Art at (828) 251-5796, visit the gallery website at www.ashevillegallery-of-art.com, or go to the gallery Facebook page.